The corporate clients from Nutcracker Sweet Gift Baskets absolutely love our corporate baby collection for a reason; we provide absolutely adorable bundle of joy. At Nutcracker Sweet, we make corporate welcomings simple and provide fast and friendly service all year long. Our beautiful and sizeable arrangements make new parents squeal with pride and joy for their new child and the company that they are affiliated with. We customize our vast baby basket selections specifically for your company. We can include your logo and even your own company merchandise in the gift, showing your recipient that their milestone did not go unnoticed among coworkers. At Nutcracker, we care about the impression you make with your gifts, so we work with you to make our presentation as beautiful and grand as possible. We customize our baby baskets at any price point and size and provide a personal message from the company to add a personal touch to your gifts. Your company logo placed on a beautiful satin ribbon is the perfect finishing touch that will make your personal gift basket memorable for every recipient. In addition to your lovely gift baskets, we can even specially design and craft your own company gift basket collection. 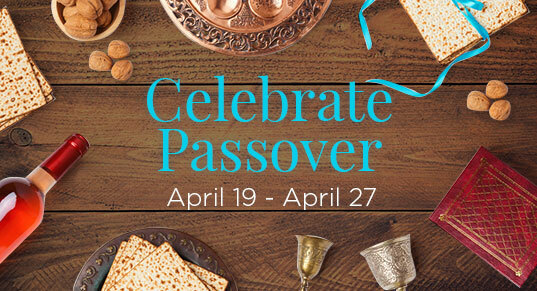 We will help find the perfect products for your gift baskets, which will serve as a wonderful sample and advertisement for your company. We are dedicated to working hard and discussing designs for your custom gifts to ensure you receive what you envision. Any corporate baby basket you choose from Nutcracker Sweet will always show distinction and care that will reflect back to your business. At Nutcracker we have a number of incredible professionals on call that are fully equipped to help you at all working hours. We know that time is precious so we do our best to make the process as quick and effortless as possible. We take orders for hundreds of custom baby baskets from many different companies across North America and we take the responsibility of representing your company very seriously. With one phone call, Nutcracker Sweet will make all your custom gift baskets a reality. Our professional gift designers and friendly Nutcracker Sweet Team are ready to make all your orders any time of the year. 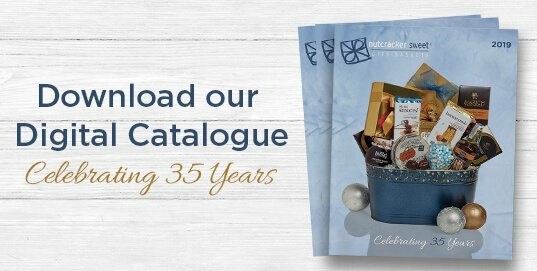 Gift baskets are our business; we have been doing this for 35 years so we know exactly how to make a lasting impression that is sure to be appreciated. The baby baskets are a favourite among our staff and customers. Each and every one is a crowd pleaser and definitely the shining star of any baby showers. They come in fun bright colours filled with tons of wonderful surprises that give new moms and dads a cuteness overload. 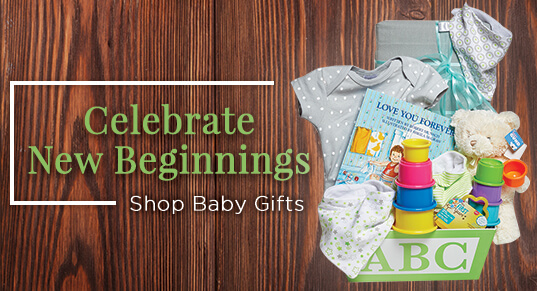 In every baby package we provide fun toys, soft clothes, huggable plushies and more. Anything the little bundle of joy needs we will have in your gift basket. All our baby gift baskets can come in gender specific and neutral colour palettes. 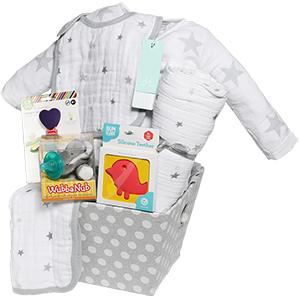 All of baby's items are packaged in beautiful containers that can be used in the nursery or playroom for years to come. Give your coworkers, customers and other work connections your support by congratulating them with a fantastic custom baby basket. All your corporate baby gift baskets will come with our seal of approval. Every gift basket that leaves Nutcracker Sweet will always be the finest gift basket that will be sure to impress all your recipients. Your gift baskets will all be hand made by our gifting professionals and designers to ensure pristine quality upon arrival to your recipient. Nutcracker Sweet is always excited and ready to craft special gifts because we know that every basket will always carry a loving message. We strive to be innovative and creative not just for ourselves but for you as well, we want to make your gifting experience simple and flawless. 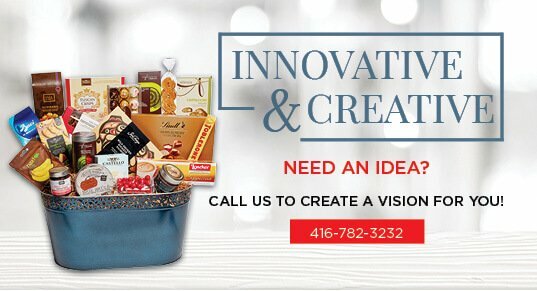 Call today at 416-782-3232 to get in contact with one of our corporate gift basket experts and you can get your custom made gifts done in a blink of an eye.